REDARC Solar Regulators ensure that the power supplied by 12 or 24 volt solar panels is at the right voltage to charge auxiliary batteries. REDARC Solar Regulators are suitable for charging up to two seperate battery banks and come in 10, 20 or 30 amp models. The REDARC 10A Solar Regulator ensures the correct charge is supplied safely and efficiently to charge an auxiliary battery. Available with Anderson™ SB™50 connectors. 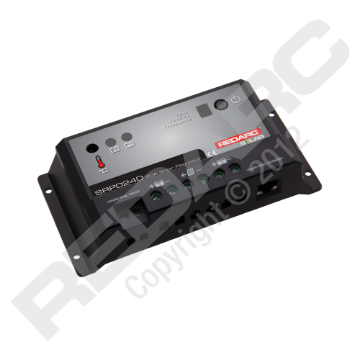 The REDARC 10A Solar Regulator ensures that the power supplied by 12 volt or 24 volt solar panels is regulated to the right voltage to charge auxiliary batteries. The REDARC 20A Solar Regulator ensures the correct charge is supplied safely and efficiently to charge an auxiliary battery. Available with Anderson™ SB™50 connectors. 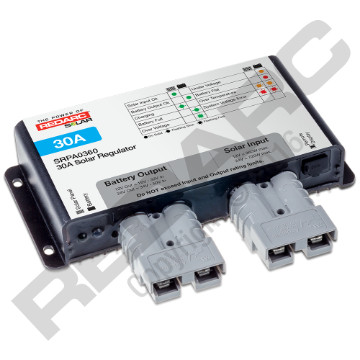 The REDARC 20A Solar Regulator ensures that the power supplied by 12 volt or 24 volt solar panels is regulated to the right voltage to charge auxiliary batteries. The REDARC 30A Solar Regulator ensures the correct charge is supplied safely and efficiently to charge an auxiliary battery and is ideal when multiple REDARC solar blankets are used simultaneously. Available with Anderson™ SB™50 connectors.